I keep it RIGHT THERE because it’s at my eye level when I’m cooking, which I seem to do a lot of! I need to be reminded that my work matters, as God is “establishing” it: setting it in stone. I can’t help but read it and reread it and reread it. And many times, I also pray it. Not only is running a home tough, but running a home-based business can also be challenging! Results are slow to come or non-existent. You blog. You market. You finish one assignment and take on another. You write a little today on this eBook and a little bit more tomorrow. But your traffic numbers, your sales figures, and your social media connections don’t budge. 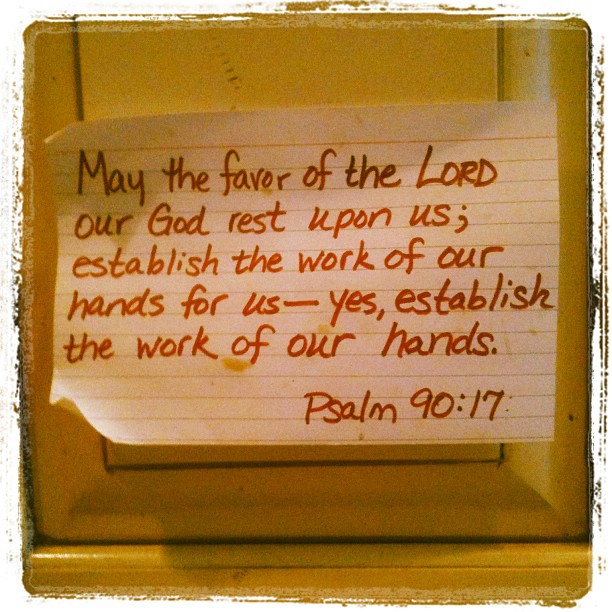 Pray Psalm 90:17 and realize that your work—all of it—is not in vain. And guess what? It’s not temporary, either. God will redeem all things in the new heavens and the new earth. If our work today is set in stone, what may it look like redeemed to its intended glory for all eternity?